52 Reflections on the Gospel of John: #19. 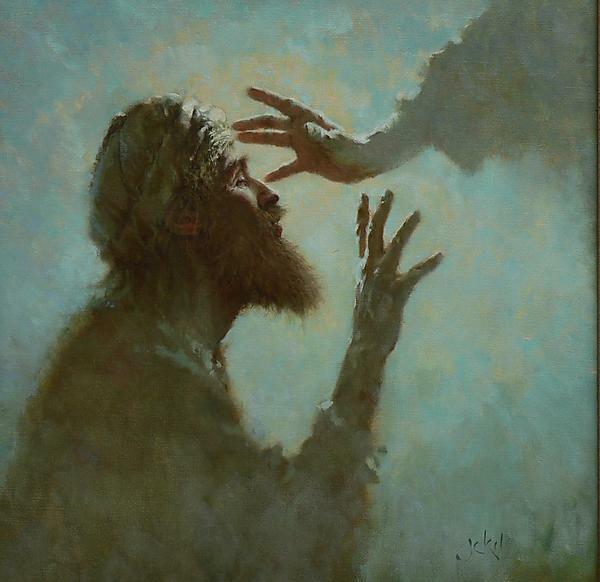 Healing the Blind Man (Part 4). If you have been reading up to this point, hopefully you realize that signs are meant to point to something. They are not simply miracles or historical events. They are lessons with spiritual application. This sign of healing this blind man is no different. Jesus wants to teach a lesson in this sign. I think the primary lesson is that Jesus, as the light of the world, brings vision and color and clarity to a world of darkness. Those who are blind, will now be able to see because of Jesus. Those who “see” will only realize how blind they truly are. A ton can be learned by looking at the actual way that Jesus performed the signs. Take a moment and read Ezekiel 4. Ezekiel gets bricks, inscribes cities, lays siege to it, builds an iron wall, lies on his left side 390 days then his right side 40 days, then he makes bread and cooks it over cow dung. Why is he doing all of this? It’s a sign. It illustrates something. It is supposed to be out of the ordinary. That’s exactly the type of thing Jesus is doing when He heals the blind man. The way Jesus performed the sign is interesting on a number of levels. For one thing, He made clay. He didn’t just use His hands to touch the guy’s eyes; He spat, kneaded dirt, made clay, and rubbed it on the man’s eyes. He didn’t have to do it this way. This seems to have been an intentional act to separate the honest seekers from the hard-hearted accusers. Why? Watering the ground and making clay was forbidden on Sabbath. Certainly the intention of the Law of Moses was not to forbid spitting or healing on the Sabbath, but things had become so precisely defined that even making a small amount of clay was forbidden by Sabbath tradition. Just like in John 5. Healing the man at the pool of Bethesda did not violate the Sabbath, but when Jesus told him to “take up your bed and walk” (John 5:8), He was just inciting people. Carrying your bed was forbidden on the Sabbath just like making clay was forbidden on the Sabbath. Jesus is purposefully stirring up controversy. Notice the way the story is told, “Now it was Sabbath on the day when Jesus made the clay and opened his eyes” (John 9:14). This is where you find out what people’s hearts are really like. Will you care more about spitting on the Sabbath, or that a man born blind is now healed? Some people think, “it doesn’t matter that the man was healed, we know Jesus can’t be from God because He just broke the Sabbath. He’s a sinner!” Others think, “it doesn’t matter that He just broke the Sabbath, He just did something that’s never been done before, He healed a man born blind! He’s clearly not a sinner!” Jesus gives people something to argue over to see who will really, honestly, care about the sign. It is also interesting that this is another example of Jesus healing from a distance. Just like He saw Nathaniel from a distance (John 1:47-49) and healed the royal official’s son from a distance (John 4:51-54), Jesus also heals this man from a distance. Time, space, and distance have no power over Jesus. He was nowhere around when the blind man was healed. In fact, he didn’t even know where Jesus was (John 9:12). How could he? He was still blind when he was last with Jesus. By the time he got to the pool, washed, and could see, Jesus was already gone. He had no idea what Jesus looked like until John 9:37 when Jesus revels Himself as the Son of Man, saying, “You have both seen Him, and He is the one who is talking with you.” This is an illustration of Jesus’ power over time, distance, and creation. He can make mud and water from a distant pool have healing power. Also of note is that it took “washing” for the man to see. “Washing” and “Water” both seem to have symbolic meaning in the Gospel of John. One must be born of “water and Spirit” to enter the kingdom of Heaven (John 3:5). Jesus offers “living water” that leads to eternal life (John 4:10-14). Jesus cries out, “‘If anyone is thirsty, let him come to Me and drink. He who believes in Me, as the Scripture said, “From his innermost being will flow rivers of living water.”’ But this He spoke of the Spirit, whom those who believed in Him were to receive” (John 7:37-39). Jesus tells Peter, “If I do not wash you, you have no part with Me” (John 13:8). John 13:11 makes it clear He is talking about more than just cleaning dirty feet (even afterward his feet were washed, Judas was still “unclean”). At His death when His side is pierced, “blood and water” poured out (John 19:34). When this man washed his eyes with water, He regained His “sight”. “Sight,” like light and darkness/day and night, also has strong symbolism in the Gospel of John (John 9:4-5, 39-41). Perhaps the “washing” has a deeper level of meaning also. Perhaps, like His references to the Lord’s Supper (John 6:53-58), He gives glimpses of baptism in symbolic language also. The symbolism is even more apparent when you realize he washed in “the pool of Siloam (which is translated, Sent)” (John 9:7). What an interesting name. The idea of being “sent” is a major theme in the Gospel of John (John 1:6; 3:17; 5:36; 6:29; 7:29; 17:8, 18; 20:21, and many more passages). This whole story is introduced by Jesus saying, “We must work the works of Him who sent Me” (John 9:3). Jesus is the One sent by God. The blind man, without seeing Jesus, goes to wash at the place “Sent”, and comes back seeing. Perhaps the pool called “Sent” represents the One who was “Sent.” Perhaps we must follow the example of this blind man if we are to receive sight from the Light of the World. We must go to the One Sent, we wash in water, and we receive sight. Jesus came so that those “who do not see may see.” Perhaps this is a similar picture to being “born again with water and Spirit” which is essential to “seeing the kingdom of God” (John 3:3-5). That’s what this blind man did. And it worked out pretty well for Him.